DRIVING THE CONVO — The Obama administration had control over the timing of the UN Security Council resolution (UNSC 2334) rollout, an anonymous former Obama official revealed to the New York Times. The White House wanted the resolution to wait until after the 2016 election, so as not to create political problems for Democrats. “There is a reason the U.N. vote did not come up before the election in November,” the unidentified former official told the Times. This new information contradicts claims made by the Obama administration at the end of 2016 that the White House was caught by surprise when Egypt proposed 2334. President Obama then instructed his U.N. Ambassador Samantha Power to abstain, an effective endorsement of the resolution. Of note: Trump cancelled the Israel trip in the end after the PM condemned his comments. Trump told Jewish Insider in April, 2016 that he was “disappointed” with Netanyahu over the statement. 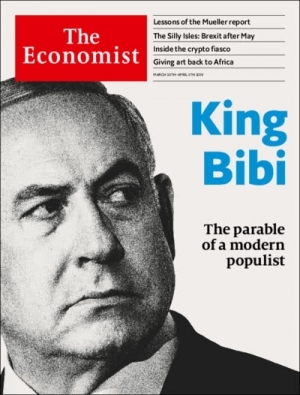 ANOTHER KING BIBI COVER — After being featured on the Time Magazine’s cover in 2012 as King Bibi, Netanyahu got the title back in his bid for a 5th term, this time featured on the cover of The Economist. “The reign of King Bibi is a parable of modern politics: the rise of a talented politician and a long success based on a perplexing mixture of carrying out sound policy and cynically sowing division,” the magazine writes in a series of featured articles about Netanyahu. ON THE HILL — by JI’s Laura Kelly: Rep Eliot Engel (D-NY), Chairman of the House Foreign Affairs Committee, implored the State Department to treat the threat of white nationalist terrorism as a foreign policy priority, referencing the massacres at a mosque in New Zealand and the Tree of Life synagogue in Pittsburgh as evidence. “Just as with Islamist terrorism, we must target white nationalist terrorism, and the networks and ideologies which underpin it globally to safeguard the United States, our allies, and our interests,” Engel wrote in a letter. Rep. Engel called on Secretary of State Mike Pompeo to name the New Zealand attacker a “Specially Designated Global Terrorist,” a mechanism to punish financial backers and disrupt terrorist funding. “Now is the time to combat this scourge with a multifaceted approach – one which includes a global component in which the State Department must be a key player,” he wrote. Senators Bob Casey (D-PA) and Tim Scott (R-SC) reintroduced the Antisemitism and Awareness Act this week, an effort to protect students in schools and universities from discrimination stemming from antisemitism. Sen. Scott first introduced the bill in 2016 although it failed to gain momentum. “It is crucial to have clear and concise language defining anti-Semitism in the event that violence and hatred occurs,” Scott said in a statement. The bill defines antisemitism from language adopted by the State Department from the International Holocaust Remembrance Alliance. The bill also gives more authority to punishing incidents of religious discrimination and religiously-motivated hate crimes. A day before the annual Arab League summit in Tunis, Tunisian Foreign Minister Khemaies Jhinaoui told Arab foreign ministers that the country will coordinate with fellow Arab countries to contain any fall out from the U.S. decision to recognize Israeli sovereignty over the Golan. Sigal Mandelker, under-secretary of the Treasury for Terrorism and Financial Intelligence, told reporters in Singapore the United States had placed additional “intense pressure” on Iran this week. Action had been taken this week against a network involved in an Iranian sanctions evasion scheme — a network that includes Iran, UAE and Turkey-based front companies, she said.